This is a truly rare record whose reputation as an underground deep classic is well deserved. 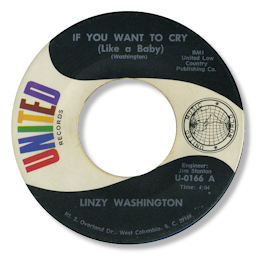 It seems to have been the only single that Linzy Washington, who probably came from Columbia, SC where this was cut, ever recorded and both sides are top-class ballads. Although "You Don't Know" has a good melody the track I would like to concentrate on is If You Want To Cry as on it Washington gives a much more hard edged vocal. And the hoarse tone that he adopts is much more to my taste. He only backed by a rhythm section, no horns, so the focus is very much on Washington himself and the excellent uncredited second vocal. UPDATE ~ My great friend Greg Burgess writes with the good news that "Linzy Washington is evidently alive and well and recording gospel music with his wife Karen in Clarendon County, South Carolina." I'm always grateful to Greg for his research. Thanks to Jason Perlmutter (see Links).